Located in Charleston County down on the Atlantic Coast, Charleston is the biggest city in all of South Carolina and is also the oldest, being founded in 1670 and named King Charles II of England. Stretching out over more than 127 square miles and being home to around 134,000 people, with close to 750,000 in the full metropolitan area, Charleston has a fascinating history and has grown over the years to become a major economic, cultural, and transport hub for the state of South Carolina. It's also a highly popular touristic destination, well-known for its colored homes, upscale restaurants, and very friendly people. It has even been ranked as one of the friendliest cities in the United States by several travel publications and even earned a 'World's Best City' award from Travel + Leisure. There are several historic plantations to visit around the Charleston area, as well as additional historic spots like Fort Sumter and the old French Quarter. Other popular hotspots for tourists to check out include the Battery district, Charleston Harbor, Patriots Point, and Waterfront Park, so there’s a lot to see and do in this city, and if you're planning a trip to Charleston, SC, there are lots of great RV parks and campgrounds all around the city and surrounding area to accommodate you and your fellow travelers for the duration of your stay. 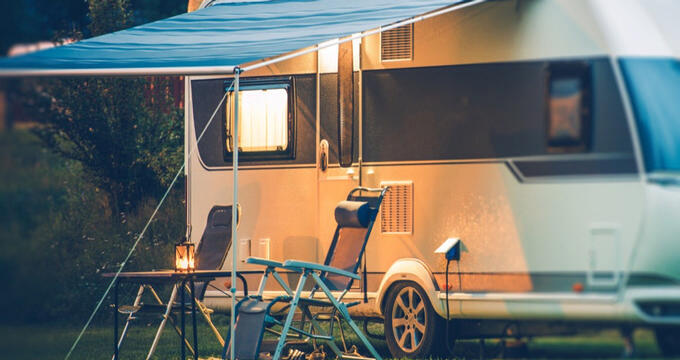 Read on to learn all about the best RV parks in Charleston, including contact information and in-depth overviews of each park. Charleston is a beautiful city to explore, with a lot of lovely architecture and interesting historical sites, but if you're visiting this South Carolina city for a little outdoor recreation, the Campground at James Island County Park could be a great place to base yourself. As the name suggests, this campground and RV park is located right in the James Island County Park. Surrounded by greenery and wildlife, this RV park and campground is in a prime spot for recreational activities of all kinds. The county park itself stretches out across more than 640 acres of land, offering countless scenic walking trails and being a great place to do some wildlife watching. The sights and sounds of the city itself are only a short drive away as well, so you can spend some time enjoying the attractions of Charleston and then retreat to the comforting surroundings of this natural haven in the evenings. On-site amenities here include fire pits, grills, laundry facilities, picnic tables, beautiful bathhouses with showers and toilets, high speed Wi-Fi, full hook-up RV sites with 20, 30, and 50 amp service, propane and firewood sales, paved roads, and an activity center. At the opposite end of Charleston to the Campground at James Island County Park, Charleston AFB RV Park is situated up in the northern part of the city but offers quite a similar experience; it's in a quiet, cozy, tree-lined setting with a lot of nice walking and biking trails nearby, while also being only a relatively short drive away from the major attractions and landmarks of Charleston itself. This is a very highly rated campground and RV park, with many guests leaving 5 star reviews and returning to Charleston AFB RV Park many times after their first visit. The park itself is easy to access off I-26 and is open all year long. It features high speed Wi-Fi hotspots and lots of useful amenities including a picnic area, a play area for the kids, a local golf course, a snack bar selling food and drinks, a recreation center for fun and games, a bowling center nearby, a dump station, a mini-mart, a fitness center, and 40 RV sites. One huge advantage of spending some time at this Charleston RV park is the rates. It costs only $23 for a full hook-up site at Charleston AFB RV Park, making this one of the most affordable RV parks in the city. Very easy to access just off SC-162, the Lake Aire Campground is another super option for stays in the Charleston area. It's not technically in Charleston, being located in the neighboring town of Hollywood, but is just easy of the city and only a short drive from many of the major attractions and waterfront areas. As the name of this RV park suggests, it's located on the banks of a lake, with many of the RV spaces offering lovely views of the lake and surrounding forest. There's a very friendly and welcoming vibe at this RV park, with the staff always ready to lend a hand. The Lake Aire Campground and RV park stretches out across 35 acres of unspoilt South Carolina scenery, with a variety of RV sites to be found including full hook-ups and pull-thrus. All sites come with their own private picnic tables and fire rings. On-site amenities include a playground for young children to enjoy and a swimming pool. The biggest advantage of this park is, of course, its on-site lake, which is great for fishing and relaxation. This is a Good Sam campground and RV park too, offering discounts on stays for all Good Sam Club members, as well as AAA members and more. Regular daily rates start at just $46 for a 30 amp, water and electric site or $52 for a full hook-up 50 amp power.